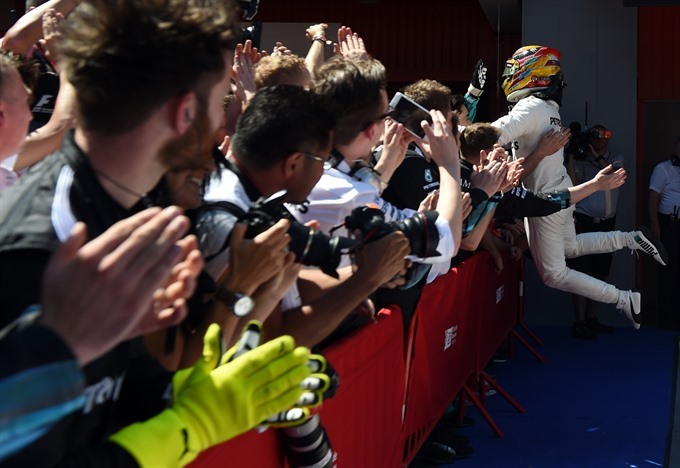 MONTMELÓ, Spain — Lewis Hamilton roared back into serious contention for a fourth drivers’ world title on Sunday when he drove to a well-judged victory for Mercedes in a dramatic Spanish Grand Prix. Australia’s Daniel Ricciardo, who was third. "That is how racing should be," said a delighted Hamilton. "Seb was really fast! My start was not good enough -- I got a bit of wheel-spin and I will have to talk to my guys about that, but the team did a great job this weekend." "At turn one, when we made contact, I just felt like I ran out of road and I was on the outside...but that is racing, and I wouldn’t have changed it for the world." After being edged into second place during a contest that delighted the crowd in Catalonia, Vettel said: "I was pushing. I had a really good start. Lewis and myself picked up wheel-spin straight away. I pulled the clutch in and could gain on him. "I stayed ahead and then got into a nice rhythm. But Lewis was fast, too. Itried to brake as late as possible into turn one, locked up, but managed to stay ahead. Then, when I was alone, he just flew past me down the straight. "It was a shame, but it was a nice race." Hamilton owed his recovery to key decisions including switching to a set of medium tyres at his first stop, when Vettel remained on softs, and a selfless contribution from his team-mate Valtteri Bottas, to win with power and precision. Bottas, who claimed his maiden F1 victory in Russia last month, retired when his engine failed while he was running third. "That was a very tough race. Physically it was hard. My neck is fine, but I lost nearly two kilos out there today and I was really straining to keep up with Seb," Hamilton added. "It is a real privilege to race against someone as good as him." Ricciardo, in a Red Bull, was more than a minute adrift of the leaders, ahead of Mexican Sergio Perez and his Force India team-mate Frenchman Esteban Ocon.